Are you looking for a CLI or GUI utility to upload programs to EFM32 microcontrollers through the factory-programmed bootloader? Look no further. EFM32 are my first choice for low-power sensor-based systems because, well, they are “Energy Friendly Microcontrollers”, providing several interesting features specially designed for that purpose and a nice set of peripherals (go figure on their website). With a 32-bit ARM Cortex processor at its core, performance is guaranteed. They also provide support for GCC ARM Embedded toolchain which, in my opinion, is a HUGE plus, making them really nice and easy to use (or getting started with), without code size limits or having to pay for a commercial toolchain (like Keil or IAR). Silicons Labs provide all the startup code, linker scripts, an easy to use and well documented peripheral library, tools to monitor power consumption and even an Eclipse-based IDE. It’s everything inside Simplicity Studio which can be freely downloaded. A great feature of EFM32 microcontrollers, by Silicons Labs, is the factory-programmed UART bootloader that may be used to upload programs into the microcontroller instead of using a commercial programmer. The bootloader uses the XMODEM-CRC protocol to transfer data and, as referred on the application note AN0003 UART Bootloader, TeraTerm, which supports that kind of data transfers, may be used. However, if you want the capability of uploading a program through your own application a command-line utility is what you need. Look no further, you have efm32_loader which can run in CLI or GUI mode (if any arguments are provided). Please be aware that, in order to prevent the bootloader from being overwritten, the linker script must be modified as described on application note AN0003. Bugs report? Suggestions or feature requests? Please use the Github or the comment section bellow. “Unable to receive chip ID”. I have used a serial port monitor and i see that you send the “U” character, but the response from the board is “?”. “BOOTLOADER version 2.00, Chip ID 24353703536201EB”, so i think that my board is OK.
Konstantinos, thanks for your feedback! That’s interesting. Which board/MCU are you using? And is the bootloader the original one (the factory-preprogrammed one)? The ‘U’ is used in order for the bootloader to detect the baudrate, as described on the application note AN0003 (https://www.silabs.com/Support%20Documents/TechnicalDocs/AN0003.pdf) And I don’t see any mention to ‘i’ being used. I’m very sorry, i just realized that i have used your program for the USB bootloader (AN0042). So, when the USB bootloader is used the “i” character is sent in order to detect it, as you previously suggested. You must still ensure that the bootloader is enabled by pulling-up the DBG_SWCLK pin and reseting the chip, as in this case the efm32_loader won’t do that for you. the Qt platform plugin “windows”. I’ve cleaned the PATH environment on my PC and the executable is able to find all dependencies. Unable to receive chip ID. Maybe something is wrong with the answer parsing? This time everything went perfect! Great! Glad it worked. Thanks for your persistence on the feedback! I guess you would appreciate the “windeployqt” command which was added in Qt 5. It automatically copies in all the required dlls, including the platform stuff which is easy to forget. I don’t have a schematic, but the connections are described on this blog post. What can’t you understand? Are you using EFM32 Loader in CLI or GUI mode? Try BOOT_EN with HIGH (1) and LOW (0) value. Thanks for reply, I have made the connection as specified in the “AN0003” reference PDF. And when I Run the VO.2.2 in windows 7. On first line it is showing “Connected ” but when I try to upload the code it is saying “Unable to get device Id “. 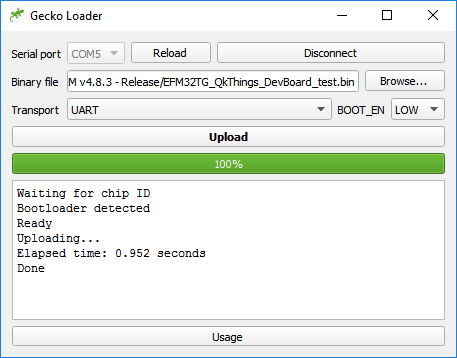 That message means the EFM32 Loader is unable to detect the bootloader inside you MCU. What part number are you using? Does it have a USB or UART bootloader? Have you programmed the MCU before, using a commercial programmer (e.g. SEGGER J-Link or equivalent)? I tried this out today with the AN0042 USB bootloader, and noticed the same “Unable to receive chip ID” problem. Further up, you mentioned changing it to simply look for “chip”, but it looks like the code is still looking for “ChipID”. I noticed is that AN0003 puts “ChipID” in the string, and AN0042 puts “Chip ID” (with a space between “Chip” and “ID”), which I’m guessing is the problem. Any chance you could roll that change (back?) into your code? I wasn’t aware of AN0042 but yes, that’s probably the case! Which part are you using by the way? I’ll change the code to look just for “chip” (lower case) and I’ll let you know when the new release is avalable. Seems to work perfectly… thanks for the super-quick fix! BTW, I’m running the Giant Gecko, which comes with the AN0042 bootloader pre-loaded.